Krystal Arnett Henson visited Ethics Lab last week to speak with students about her experience as a “designer turned activist.” Henson is the founder of WalkingDot, a DC area program that teaches human-centered design to everyday citizens. WalkingDot teaches problem solving through empathy and design and connects volunteers with their local communities—mobilizing and empowering individuals to use their talents for social change. Students were most interested in Henson’s recent work to create ways for citizens to easily become involved in the growing activist movements (even if they considered themselves introverts as Henson herself does). First she created Postcards From The People to encourage citizens to make sure their voices are heard. The online resource provides postcard templates that citizens can use to write and mail their state and federal representatives about issues they care about. Henson partnered with artists and designers to create the artwork for the postcards, which are free to print at home. Volunteer artists and designers also team up with Henson to create event and issue-specific illustrations for the postcards, including a recent campaign supporting career officials in the EPA. 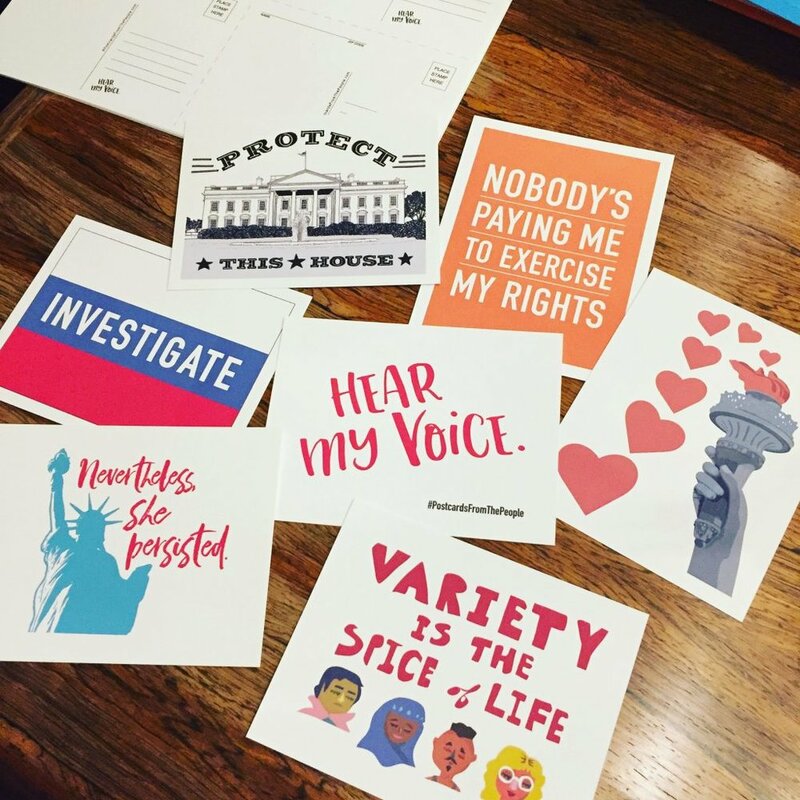 After quickly becoming known as “the postcard lady” in local grassroots circles, Henson connected with two other local activists to start Postcards For Virginia, an effort that aims to get out the Democratic vote in Virginia for the recent statewide election. Postcards For Virginia started in May of this year, in anticipation of the June 13 primary. The initial round of postcards were general “get out the vote” messages that didn’t endorse any specific Democratic candidate. Leading up to the June election, approximately 400 volunteers mailed 7,200 postcards to fellow voters. When the June election broke the Democratic turnout record by 220,000 voters they knew there was a real opportunity. The team utilized the growing grassroots network by attending meetings to share the project as well as using Facebook and Twitter to connect with volunteer writers. The project quickly became a way for people locally and even across the country to connect in person or online as a community. Organically the project grew beyond their expectations and in the end Postcards for Virginia’s volunteers personally wrote and paid for more than 136,000 “get out the vote” postcards leading up to the Virginia general election this November. Henson spoke to our students too soon after the historic outcomes of the November 7 election to offer specific insights, but her team is working with the social and behavioral scientists at CitizenBe to conduct a research study on the impact of the project. Ethics Lab students are working on a project using social media and animated slides to create five “postcards.” Students asked Henson about her path from professional designer to activist, and sought out advice and insight on how to best communicate their messages – particularly those with a call to action. In addition to her work as an activist, Henson has been a practicing designer, across multiple disciplines, for over 20 years. She has taught graduate level design at the George Washington University’s Corcoran School as well as the Corcoran College of Art + Design where she served as Chair of the Interior Design department.